I've been digging in and talking to breeders in a few places, trying not to take offence when someone says something nasty and personal, and I do think it's worth it in the long run. I have to admit to being human though. "For a woman to come from a top class show family and have her attitude is beyond our understanding. Not many words. So why does it make my eyes sting? It all centres on whether Frank knew my parents and if he knows me. 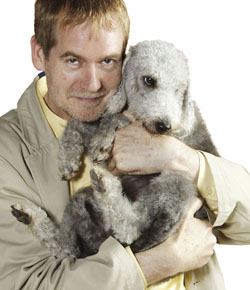 I can think of two Franks from when I was a child in the dog show world. And if it is someone who knew them and me, then this is indeed a very cruel post. My mum died only a couple of years ago, my dad a few years before that. Both died suddenly and traumatically - one suddenly in my front room within three weeks of a cancer diagnosis, the other with me at her side in hospital after three months of terrible suffering. It all still feels very raw - like it was yesterday. I do feel very alone, I do miss them so much - their encouragement meant the world to me. They were massive influences, the most supportive parents anyone could ever hope for. They believed strongly in truth and justice and it was my Dad that inspired me never to be afraid of bullies. To stand up and fight rather than run away. He achieved so much in his life, came such a long way and was loved and admired by so many people. Mum was a very great character, too. It meant a lot to have the approval and backing of my parents. Having "Frank" mention my parents seems a really massive intrusion. An out of scale attack. All I want to do is make things better for dogs, why attack me? I know your Mum & Dad were proud of you and what you have achieved in life, Beverley. They told me so on several occasions. I know too that your stance on continually speaking up about the health problems in pedigree dogs over many years and dogged determination in demanding change from the KC have cost you dear both in terms of popularity and also financially when advertisers have not wanted to be associated with any negativity in the dog world. Genuine dog lovers everywhere (and your parents were that above all) are fully behind you. Change is coming and you have been instrumental in achieving it. Well done, keep going and non illegitimes carborundum. Ditto - they were both incredibly proud of you, and they would be the first to support you in what you are doing now. They would have all the newspaper cuttings filed neatly away, and the PDE programme videoed and replayed over and over! Frank's jibe is outrageous - and not worthy of any response at all. Rise above it - don't shed tears for such a thoroughly nasty man. The Net (and dog world) is full of snide, mean-spirited people. Then there are those, like you, who are supportive, encouraging and put themselves on the line to promote good health in dogs. One sour voice might hurt, especially because he was so personal, but try and ignore it. You can tell you're getting somewhere when people are reduced to making personal remarks. I admire you and what you are doing immensely. Well it has already been said. Anyone who can produce a magazine issue such as your December's - of such balance, currency, ability to give pet owners a voice, and yet still be an ardent celebration of all things canine is someone of whom dog loving parents can be intensely proud. I have a great brother but no sisters. If I could choose some sisters I would choose you and Jemima Harrison. Whether you would like me or not as your sister!! Ha. I frequently have to gulp these days as my heart leaps at what has been achieved in these last few months on behalf of pedigree dogs. We know we are not there yet - but Beverley it is no understatement to say you are re-writing the history of the purebred dog. Do not get disheartened. The cruel jibe says much more about the twit who made it than it ever can say about you. Beverley please don't let this mean spirited comment upset you, as it was obviously meant to do. Anyone who reads this blog or Dog's Today knows how much you care about animal welfare and how much you do for it, despite putting yourself in the firing line for comments like these. Anonymous personal comments and attacks don't make me feel a high regard the integrity of the poster! Brilliant comments above. They say it all really. The beauty as I see it, of you coming from a showing background is that you have experience of showing, & can see both sides of the coin. Thank you everyone, and Pip would love to have a sister! Never had one of those. Only got a brother, but never hear from him. He lives overseas and we fell out big time when my parents died sadly. Long story, grim. I'm 46 so should be able to cope with being an orphan, but it does feel pretty weird. I'm not completely alone! I am married, I have a lovely little 7 year old boy and two lovely step sons. But I am the very top of my family tree, which I guess makes me feel a bit exposed when someone has a go at me! Feeling a lot more buoyant today. Helps to write it down and share it. We're on one hell of a voyage together, thank you to everyone who shares their experiences. We are starting to see real progress and must see this through. Please dont take personal comments posted on forums seriously - they are just another form of bullying. (perceived) power which is probably all they've got in their lives. I know what it feels like to be vunerable, in the last 5 yrs I have lost my husband, mother, toby my cavalier, and just last month my younger brother, at my brothers funeral i heard a comment by someone who suposably knew him. a simple comment, and i lost it! I had to tell him to keep his derogatry comments to himself. my feelings were so raw, normally i would ignore them and walk by, as you should do, dont lower your standards as others do, you have nothing to be ashamed of.im sure that with all you do for the dog world your parents would be proud of you. this frank must be a nasty and snide man with no happiness in his life. you are above all that.